SURPRISE! I'm going to feature my chocolate Lab, Hannah, again. Let me add here, that she needs those classes. Her biggest problem right now is jumping up on people she sees when on our walks.. almost in a "HI! HI! Come PET me NOW, I'm CUTE" way. We try to make her sit and be calm, but that's not happening. If we try to walk away, she pulls on her leash almost choking herself. We've read all the books, watched Dog Whisperer, etc. We're just missing something somewhere and hope we can figure it out soon. Enough with chatter. Bring on the cuteness! Here's a silly dog picture I found online. Hannah is darling as always. Hope obedience classes help with the jumping. Pepeu never jumped on children; but it can sometimes still be an issue with adults. Miss Andreia has ridden a little but a day in the 30's and several with rain and high winds the chances have been few and far between. I did manage to catch a couple pics of the weather last night before we went for cover. Hannah is a doll ... as usual. Good luck in school! Happy Easter and Happy Spring! What a beautiful puppy !!! I have a definite weakness for Labs, be the golden, chocolate or black..
Look how GORGEOUS she is!!! OK, the weather is nice... I'll be back! Stop by my blog to enter my mom person's Ecostore USA giveaway! hannah is simply a gorgeous doggie! i hope you can help her with the classes! it's obvious she's not being naughty, she's just excited. p.s. i love watching the dog whisperer, and i don't even have a dog! My son walks the ladies Lab next door -- there is one that needs classes she doesn't listen at all. Great shot I love the last one! 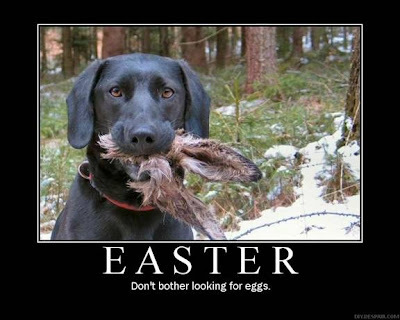 Love your dog, but not so sure about the Easter message, I was really looking forward to my chocolate bunny tommorrow. That's the yummiest chocolate I've seen all week! She's adorable, loved your picture and the video was fun to watch. Hanna is a well loved little pup. Hannah is such a nice looking pup. Sure hope she learns her manners so everyone will love her as much as you do! Hannah is such a cutie! lovely picture and a cute healthy dog. Oooohhh, Hannah is so sweet and cute! I love the way she returns the ball and then thinks 'uhuh, not going to give it to you'. Have fun with the dogtraining.